Economist John Goodman asks "Is there a moral case for Obamacare?" What cries out for moral justification are the mandates and regulations being forced on the other 300 million people. Why are they being forced to pay more, or allowed to pay less, than the true cost of their insurance? What moral principle can justify that? Gives people in health insurance exchanges up to 10 times as much federal subsidy as people at the same income level getting insurance at work. Forces young people to pay two or three times the real cost of their insurance in order to subsidize older people who have more income and more assets. Takes from low-income seniors in order to provide subsidized health insurance for non-seniors who have higher incomes. Takes from people who use tanning salons and people who need crutches and wheelchairs and pacemakers and gives to … well …. who knows? If we accepted inequality in health care, instead of insisting on instant equal access for everyone to the newest, best and most expensive treatments, where would health care be today? It's impossible to even imagine what treatments and cures would be available and affordable. A multi-tiered healthcare system which respects individual property rights (instead of violating them through coercive wealth redistribution ) is not only the right thing to do, but we would all be better off in the long run. On the 4th of July, we must remember why we celebrate. Today I will rejoice in the freedom we have in this country--but not for a second will I forget the fact that there are many who do not understand what a precious and fragile gift we have inherited. ObamaCare also requires insurance companies participating in exchanges to have their marketing approved by the government. Supporters of ObamaCare may find that title offensive, but it is a more accurate and neutral moniker than a title which claims the law is affordable or that it protects patients. ObamaCare is more than an attack on our healthcare freedom. If allowed to stand, it will push us further toward the collectivist end of statism. Either a man owns his own life, or he does not. Our country was rightly founded on the belief that he does. ObamaCare is premised on the collectivist premise than a man's life is held hostage to the will of the majority and needs of "society." Compassion for the sick, poor and disadvantaged are essential parts of being human but can never justify initiating force. To maintain a peaceful, prosperous and civil nation, we must devise solutions to our problems while ruthlessly respecting every individual's right to life, liberty and the pursuit of happiness. Have a glorious 4th of July. This ribbon is to raise awareness of the recent damage our government has caused to health care freedom and the integrity of the doctor-patient relationship. Under the new law (PPACA), physicians will be compelled to base their advice and treatment on politically determined goals, even when in conflict with the best interest of their individual patients. Larger donations and pin requests will be handled individually. See below for more BRP items including bumper stickers and sticky note pads. To donate to the project without using Payal, email your interest to blackribbonproject@gmail.com. 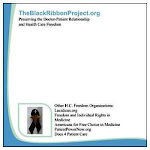 Unless otherwise noted, all blog posts are written by Dr. Beth Haynes, MD, founder of the Black Ribbon Project. A romantic, medical thriller which contrasts the character of a free market physician with that of one subservient to government.